First Energy Metals Assayed Up to 0.435% Cobalt at Phyllis Cobalt Project in Ontario | First Energy Metals Ltd.
Vancouver, B.C. 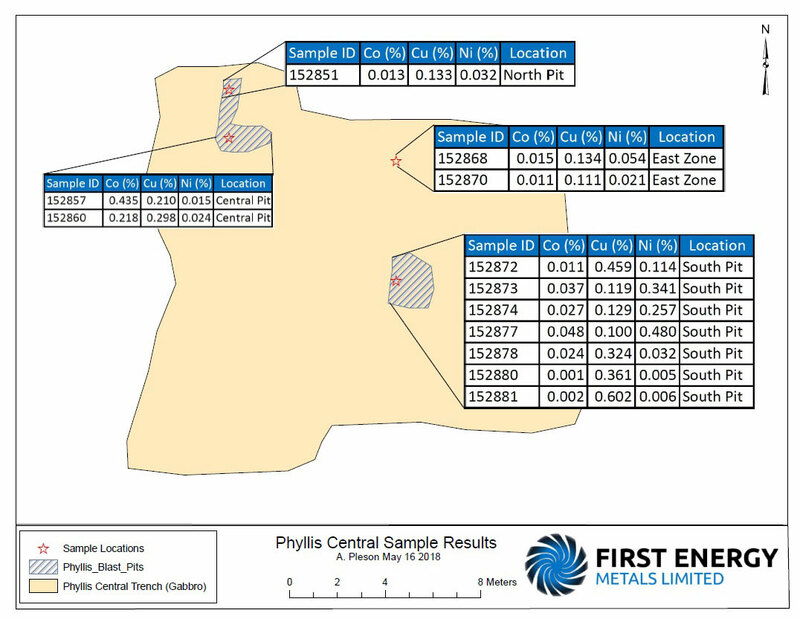 (May 23, 2018) – First Energy Metals Ltd. (TSX-V: FE) (the “Company or “First Energy Metals”) is pleased to announce that it has received assay results from its recently concluded Phase I exploration work at the Phyllis Cobalt Property (the “Phyllis Property”). Highlights of the results are presented below (for details see attached table and map). The samples tested for gold, platinum and palladium returned with low values these precious metals. A total of 31 grab rock samples were collected during the Phase 1 exploration work which was comprised of prospecting to locate historical cobalt (Co) showings; trenching and sampling to confirm historical cobalt, copper and nickel mineralization; and geological mapping to further explore the cobalt mineralization along its trend. Another purpose of the work was to locate ground geophysical survey areas and drill hole targets for the next phase of exploration. The samples were submitted to Activation Laboratories (ACTLABS) in Thunder Bay, Ontario and were tested either at its Thunder Bay or Ancaster labs in Ontario. Actlabs is an independent group of laboratories accredited to both ISO 17025 with CAN-P-1579 for specific registered tests. - Code 8 AR ICP-MS: A 0.5 g sample is digested in aqua regia and diluted volumetrically to 250 ml with 18 megaohm water. CANMET reference materials for the appropriate elements are digested the same way and are used as a verification standard(s). Samples are analyzed on a Varian Vista 735 ICP-OES or ICP-MS.
- Precious Metals package, Code 1C- ICP OES Fire Assay (FA-ICP): A 30 g sample is mixed with fire assay fluxes (borax, soda ash, silica, litharge) and with Ag added as a collector and the mixture is placed in a fire clay crucible. The mixture is then preheated at 850°C, intermediate 950°C and finish 1060°C. After cooling the sample solution is analyzed for Au, Pt, Pd by ICP/OES using a Varian 735 ICP. The instrument is recalibrated every 45 samples. On each tray of 42 samples there are two method blanks, three sample duplicates, and 2 certified reference materials (Source: Actlabs website). The technical information contained in this news release has been reviewed and approved by Alexander Pleson, P.Geo., a qualified person, as defined by NI 43-101 who works as consultant with the Company. The current exploration work was carried out under his supervision. First Energy Metals Limited is a junior resource company engaged in the exploration and development of technology metals such as lithium and cobalt properties in North America. The Company’s goal is to acquire prospective technology metals projects and develop them. The Company has 100% interest in the Kootenay Lithium Property. The property is located in the Revelstoke and Nelson Mining Divisions of southeastern British Columbia. First Energy Metals Limited (formerly “Agave Silver “) was incorporated on October 12, 1966 in the Province of British Columbia. The Company’s common shares trade on the TSX Venture Exchange under the symbol FE and are also listed on the US OTC Markets (Pink) as ASKDF and on the Frankfurt Stock Exchange as A2JC89. The Phyllis Cobalt property consists of 5 claims in 112 units totalling 1792 hectares land located in the Kenora Mining District of Ontario. The property boasts year-round access 192 km northwest of Thunder Bay, ON via Hwy 17 and 9km south on a gravel forestry road. Geologically, the Phyllis claim block occupies the central portion of an ENE-WSW trending greenstone belt, consisting of Mesoarchean to Neoarchean age mafic to ultramafic rocks. These are bound by granite of varying composition - ranging from tonalite to biotite-granodiorite.